Dotted around the country are about 35 massive orange Mitre 10 Mega stores that all have mega rain water harvesting capabilities in the form of a massive roof area. Mitre 10 Mega in Hornby outgrew its original mega premises rather quickly so when it came time to build a bigger and better premises next door, they took the time to think a bit wider about what they could do better the second time around. A natural place to look to is water consumption and with a comprehensive garden centre in the store water consumption is high with irrigation coming on every night to keep the plants fed and watered. The beauty of rain water harvesting is that it is a win-win in that it can save money and give you a clear conscience. When speaking with Chris Foster, Retail Manager at Mitre 10 Mega Hornby, he explained that they had never run out of irrigation water to his knowledge. This means that the three 15,000 litre tanks pictured below are harvesting sufficient water to carry them through the dry months, allowing full irrigation to take place without touching any town supply water. This garden centre can operate with a clear conscience knowing they have not been depleting the Christchurch reservoir. Naturally this mammoth saving on water carries straight over into the net profit of the business as no longer are they paying thousands of dollars in water rates on an annual basis. This 45,000 litres of rain water storage sits pride of place in the garden centre for all to see and admire. 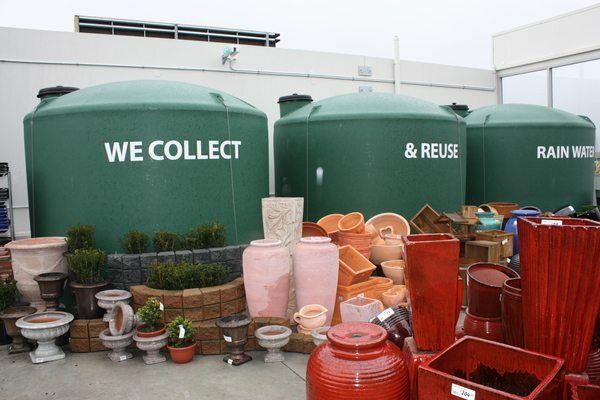 Often it is peoples desire to hide their water tanks but not at Mitre 10 Mega Hornby, where they are proud as punch of their rain water harvesting installation. Devan have a large number of commercial rain water harvesting installations in place which range from 5,000 litres for a small factory to run through toilet cisterns through to 300,000 litres to provide ‘soft’ water for a large dry cleaning and laundry plant in the Hawkes Bay. Large volume water storage via polyethylene water tanks does not require resource consent like other single large volume tanks and can be a much more efficient use of space where they can be lined up rather than taking up a massive circular area. Whatever volumes need to be stored, Devan can assist in providing cost effective storage solutions which can save money and have a positive impact on the environment.